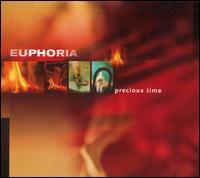 Review: "Euphoria: Precious Time" - Sea of Tranquility - The Web Destination for Progressive Music! Some critics have labeled Euphoria's intoxicating concoction of instrumental music "electro-blues" and "guitronica" � and that's half right. Those labels accurately describe the twangy and rootsy appeal of the 12-string and slide guitars on "Back Against the Wall," the leadoff track from Euphoria's third studio album, Precious Time (complete with a tough Chicago blues-style harmonica). Other tracks, such as "The Glendale Train," "Forever Dust" and "Fire in the Hole," also retain that organic vibe while percolating with bubbly and danceable programmed electronic undercurrents. But the above terms ignore more traditionally techno and so-called "chill" songs like "The Getaway" and "Kolkata." But wait, there's more: Main composer and guitarist (not to mention accomplished E-Bow player!) Ken Ramm also tosses in four appealing songs with vocals � two featuring American singer/violinist Tracy Bonham and two boasting Tina Dico, singer for the Danish electronic duo Zero 7. Dico's contributions steer Euphoria in a more mainstream-rock direction; Bonham's songs, meanwhile, sound a little more dreamy and atmospheric, sort of like The Gathering in recent years. The women perform gracefully and elegantly, adding yet another dimension to a disc that also incorporates elements of Pink Floyd, Brian Eno, Moby and Massive Attack. On the other hand, "Vapor" is just that � ambient mist that's not too memorable (at least until you get to the surprise ending). Nevertheless, Precious Time's unlikely but likeable blend of rock, blues, roots and electronica music makes it a fine addition to any adventurous listener's collection.